What actually advances European policymaking in the field of migration? Scientific evidence, political decisionmaking or civil society activism? 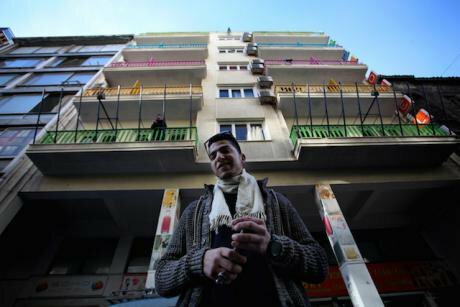 The Soho Hotel, housing 150 refugees mainly from Syria and Iraq, is one of two SolidarityNow buildings in Athens supported by UNHCR and funded by the EU. NurPhoto/ Press Association. All rights reserved.Southern European countries and more specifically Greece and Italy have faced rising flows of asylum seekers and irregular migrants since 2013, and particularly during the 2015-2016 period. Indeed no-one predicted the dramatic escalation of irregular maritime arrivals during 2015, lasting till March 2016 along the Turkey-Greece corridor, and to this day along the Libya-Italy corridor. Major challenges that such arrivals bring to light include the need for internal EU solidarity in sharing responsibility, the ‘burden’ of processing asylum seeking applications, and eventually of integrating those admitted as refugees. The Emergency Relocation Mechanism launched first in May 2015 and further expanded in September 2015 has played an important role as an EU policy response, seeking to enforce the more equitable sharing of responsibility for asylum-seekers among member-states, and thereby taking some of the pressure off the frontline states. The plan foresaw 160,000 relocation places in total, to be implemented over a two-year period (September 2015 to September 2017), more specifically assigning 66,400 places to people to be relocated from Greece and 39,000 from Italy to other EU countries. Relocation is selective and applies only to those nationalities whose applications for international protection (refugee status or subsidiary protection) have over a 75 per cent success rate on the basis of quarterly Eurostat data. Thus, Syrians have steadily been eligible for relocation while for instance Afghans, Iraqis or Eritreans have moved over and under this threshold. In order to understand how the emergency relocation quotas came about, one needs to consider the size of the flows reaching Greece via Turkey and Italy via Libya in 2015. During 2015, Greece received through its sea border with Turkey over 800,000 people while the flows continued unabated during the first three months of 2016 when a further 140,000 people crossed the narrow straits that divide the Turkish coasts from the Greek islands in the Aegean sea. The top countries of origin of irregular maritime arrivals to Greece were Syria, with over 50% of the arrivals, Afghanistan (25%- 30%) and Iraq (nearly over 10% and nearly 20% in recent months). These were populations clearly in need of international protection. In Italy, arrivals have been rising since 2014 with over 150,000 in 2015, approximately 181,000 in 2016 and nearly 60,000 already in the first half of 2017. The nationality composition differs significantly compared to Greece with Nigerians, Eritreans, Sudanese, Somalis and Gambians being among the five largest nationality groups. Among these clearly Eritreans, Sudanese and Somalis are people fleeing violence and persecution in their own country and hence the flows involve a high percentage of asylum seekers. The emergency relocation scheme was both innovative in terms of asylum policy and ambitious in its conception. It showed the strong political will on the part of the President of the European Commission to enforce burden sharing. Naturally its implementation was not free of challenges. Indeed the first implementation issues stemmed from the actual pre-registration and processing of people upon first reception in Greece and Italy. They included a certain reluctance on the part of the destination member-states and the emergence of what has been dubbed ‘shopping lists’ of people for relocation (for example, vulnerable groups such as unaccompanied minors, single mothers, victims of trafficking, or highly-educated persons). Source: European Commission, periodic reports available here. The European Commission has also described as problematic the inadequate or unjustified grounds for rejecting relocation requests. 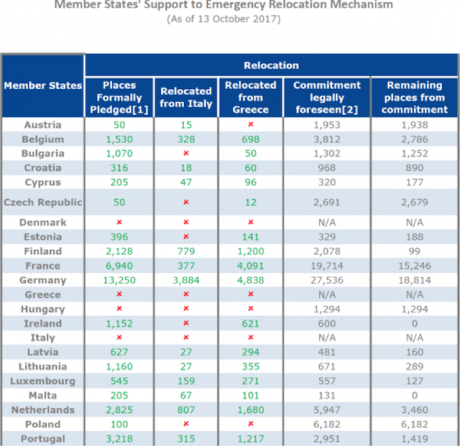 However, the Greek Asylum Service, for instance, has explained how following up on rejections of relocation is difficult, because of the relocation scheme’s overall design, given that member-states’ sovereign right to refuse to relocate asylum seekers cannot be challenged (AIRE, ECRE report). Naturally the whole issue has been further complicated by fears of terrorist infiltration of asylum seekers, particularly from Syria. Responding to the legal action taken by Slovakia and Hungary, the Court of Justice of the European Union has upheld that the emergency relocation quotas are in line with EU law. While this decision is important at the political level, it probably did not do much to change the implementation level where problems and delays have persisted. 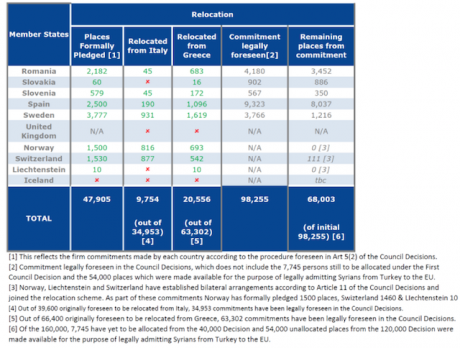 As of 13 October 2017, there had been approximately 48,000 requests for relocation lodged by Greece and Italy and just over 30,000 people were actually relocated (see table 1 and 2). Source: accessed on 17 October 2017. Ιt is important to clarify that when it comes to Greece, relocation is available only to people who entered Greece between 16 September 2015 and 19 March 2016. While this has been unpopular among people on the move at first, it has since been reconsidered, as the alternative is to remain in Greece with few prospects for employment. Despite its implementation problems the emergency relocation quotas have been an important policy innovation. They have been a first step towards reconsidering the Dublin Regulation and the first safe country principle. They have introduced a new way for direct sharing of responsibility for asylum-seeking among member-states. While presented as an emergency solution, the quotas are likely to become a more long-term, permanent mechanism in the impending reform of the EU Asylum system, now that the main criteria – size of the country, GDP, and number of refugees already present – have been established. This is finally taking up suggestions from researchers that had actually been circulating for at least two years. The question arises whether the relocation quotas emerged as a result of evidence-based policy making and researcher-policymaker dialogue, or whether they are the result of a political move taken in the heat of the moment, under pressure from an unfolding crisis. One might argue that all these elements combined. The idea had been circulating among academic and policy circles about asylum seeker relocation quotas. It was in November 2014 that Jesús Fernández-Huerta Moraga and Hillel Rapoport presented a model for tradable refugee admission quotas in a possible reform of the EU asylum policy while the same authors had also elaborated a proposal on tradable immigration quotas. Other authors had considered the issue of responsibility sharing and the imbalances created by the Dublin system and the first safe country principle since it found itself operating in an uneven implementation context. However, the question arises whether such proposals reached as far as European Commission headquarters because the Commission was looking for scientific evidence on the best possible approach, or whether the emergency, political will and perhaps civil society mobilisation was more instrumental in this? Indeed our answer rather favours the latter reasons over and above the effects of scientific evidence. True, the European Commission leadership was open to scientific evidence because of the situation on the ground and the need to address it through radical and effective measures. But the backing of the German political leadership in admitting refugees and showing solidarity was also crucial to the decision. The emergence of a spontaneous transnational civil solidarity movement not only in the frontline countries, Greece and Italy, but also in Austria, Germany and other countries where local people greeted asylum seekers at train stations offering food, clothes and hospitality of course played an important part too. In other words, the moment was ripe and the political will was there. However, one also has to consider the downside of the emergency relocation quotas’ measure. Indeed the quotas, as explained above, were strongly contested by Central Eastern European member states and were almost forced upon them. This has created ‘bad blood’ for the current and future Dublin reform negotiations where a permanent relocation mechanism is a red flag for many of these countries. Indeed the decision of the ECJ marks an important development, but consensus needs to be built further around this measure of direct asylum responsibility sharing. Naturally here an important part can again be played by civil society and by experts who circulate the idea, if they explain what it entails and continue to build support for it. Overall it is clear that political leadership and political will are paramount for research findings and proposals to be taken on board and transformed into policy solutions. Council Decision (EU) 2015/1601 of 22 September 2015 establishing provisional measures in the area of international protection for the benefit of Italy and Greece. European Commission 18, May 2016 available here. For a full commentary see here. Jesús Fernández-Huertas Moraga and Hillel Rapoport (2014) Tradable Refugee-Admission Quotas and EU Asylum Policy IZA DP No. 8683 November 2014, available here. Fernandez Huertas Moraga, J. and Rapoport, H. (2014) Tradable Immigration Quotas, Journal of Public Economics, Volume 115, July 2014, Pages 94-108. Bovens, L. Chatkupt, C. Smead, L. (2011) Measuring common standards and equal responsibility sharing in EU asylum outcome data, European Union Politics 13(1) 70–93.